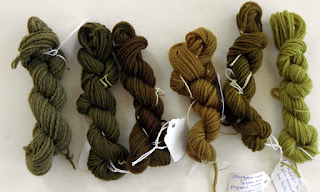 When I told my son I was attending a dyeing workshop, he heard "dying" workshop, as in death and dying. When I've mentioned fiber fests to some people, they envision eating a lot of oatmeal. I guess one must be "in the know" to know what I'm talking about. Dried hibiscus flowers (Hibiscus sabdariffa). The sample on the left is with an acid modifier, the sample on the right with an alkaline modifier, the one in the middle with no modifier. Tumeric powder. The one on the left is with no modifier, the one on the right with an iron modifier. Red onion skins. Left to right: iron pre-mordent, copper pre-mordant, alum pre-mordant, exhaust bath alum mordant (one pot method), exhaust bath alum mordant (one pot method) and iron modifier, further exhausted bath alum mordant (one pot method). I'll post photos of the black bean results later. Since dyeing with black beans takes DAYS, we finished a batch the instructor brought with her and started a new batch to take home to finish ourselves. I also brought home the hibiscus flowers from the dye bath, to see if I can extract more dye from them; they are cooking on the stove right now while a skein of Lamb's Pride soaks in plain water. I'm going to skip the mordant. Another hint to follow re dyeing with hibiscus flowers is to not rinse the yarn right afterwards but let it dry for a day first. This seems to produce a deeper color. 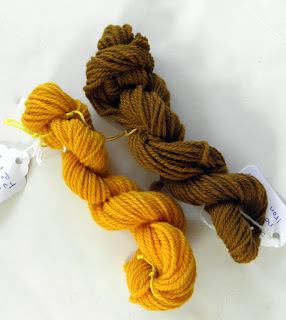 While the class started with certain goals in mind, after a while we were free wheeling, hence trying the one-pot method of mordanting (the mordant is added directly to the dye bath). 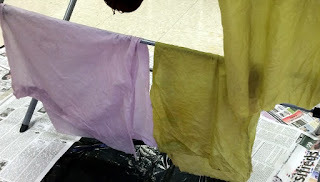 Also, one participant brought RFD (ready for dyeing) cotton cloth, to experiment with. The instructor also dyed some sari cloth in one dye bath, then because she did not like the results, overdyed it in another dye bath. 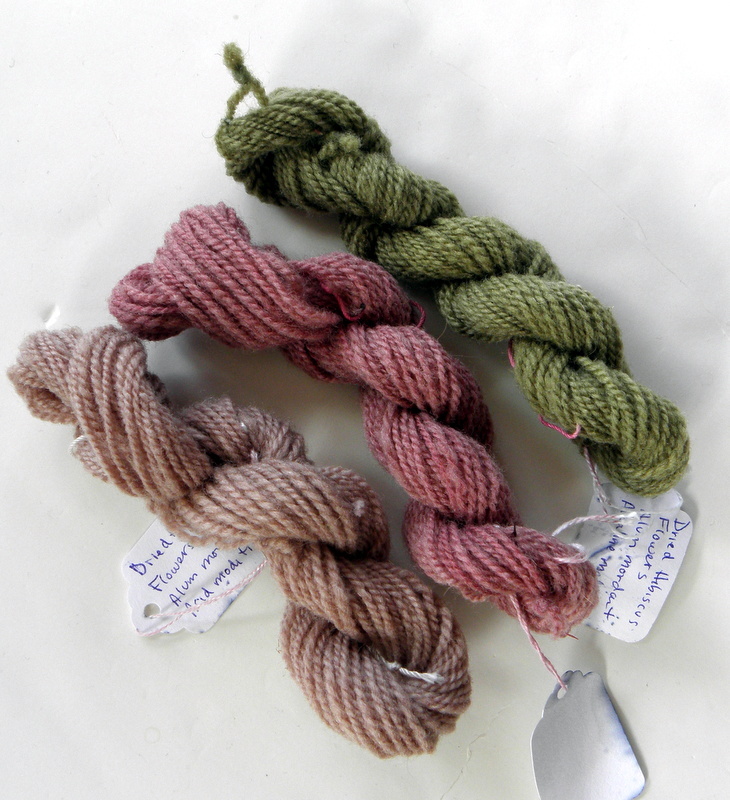 The results of natural dyeing are unpredictable, which is part of the fun. There are no mistakes, just unexpected results. I've been trying to limit my weaving experiments to stashed yarn because I have a shitload lot of it. BUT I am such a newbie that I find myself wanting to just follow a pattern instead of experimenting. Toward that end, I purchased a couple more books on weaving (Weaving Made Easy, by Liz Gipson, and The Weaver's Idea Book, by Jane Patrick) and some YARN. What we have here are two spools of Cotton Clouds Aurora Earth 8/2 unmercerized cotton ('Copen' and 'Light Turk'), and two skeins of three colors of Lion Brand Kitchen Cotton ('Blue Ice' which looks like a prefect match for 'Dusty Sky Blue' which is what the pattern calls for, 'Grape', and 'Tropical Breeze'). I won't sample these yarns since I am working from a pattern with the yarns and colors called for, BUT for when I do want to sample or experiment, I now have an Ashford Samplet loom. To give you a perspective on the size difference between the Ashford 24" and the Samplet, here is a pic of them together. Quite a difference! So besides having something smaller to sample and experiment on, I also have a lap-sized portable loom. Huzzah! Most of my art knowledge is due to my SO. He instigates trips to museums and shares various and sundry art books from the library. The most recent one he brought over is Glass Art: 112 Contemporary Artists, by Barbara Purchia and E. Ashley Rooney. These artists are far and above Chihuly (who I consider the Thomas Kinkade of the glass art world). It is amazing what can be done with glass. Of most interest to us knitters and weavers are Carol Milne, who knits with glass, and William Zweifel, who weaves with glass. Their work is simply mind boggling. These poor examples are my attempt to photograph photographs in the book, to give you a taste. Visit their websites for an eyeful. I would *love* to see these artists in action. I thought I was done knitting hats, but I guess I had at least one more left in me, for me. Modifications: Increased depth by 1"
This pattern is about as simple as can be and produces a nice stretchy hat that fits just about any adult. I made this one deeper because I like to turn up the bottom while still covering my ears. When you SSK, do you slip knitwise or purlwise? I do the former, but wonder if the latter would be better. Comments? So maybe I am done with hats... for now. The fact that the weather forecast calls for 60 degree temps tomorrow definitely discourages knitting almost anything in wool. Baa! After finishing my ruby red sweater, I wanted a matching scarf. Instead of knitting one, however, I decided to weave one, in a houndstooth pattern of red and white. I went through the motions, but the result was not quite what I wanted. To warp for houndstooth, one alternates two threads of each color across the loom. I thought the scarf would look nice with solid red borders, so I warped just red on either end, not realizing the result could not be solid red unless I executed something like clasped weft technique, which I was not prepared to do. Oh, well. Another mistake was using Cascade 220 Superwash. It is just too stretchy, especially as a warping yarn. That is why the houndstooth looks rectangular instead of square. It took me quite a while to adjust to wefting in two colors, too, so the selvages are wonky. The selvages also looked unfinished to me, so after some experimentation, I added a single crochet border. Another thing I don't like is how dominant the white is. Even though the yarns are the same, the white takes over, I presume because it is more reflective than red. The scarf has no drape, either, despite some rough treatment in both the washer and the dryer. Using worsted weight for both warp and weft is too much. All along the way, I kept second guessing my decision not to sample the yarns and pattern. 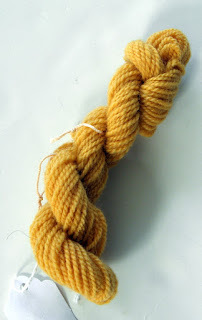 As a knitter, I am used to wasting very little yarn, whereas weaving produces a lot of waste. Creating a sample on my 24" Ashford would have wasted as much yarn as the finished sample would take. My solution to that dilemma is to purchase ANOTHER loom, fittingly called the Samplet. I pick it up on Thursday. Then I will have no excuses not to sample.